Architectural model, Competition entry 077, City Hall and Square Competition, Toronto, 1958, by D. R. Dobereiner of the Department of Architecture at the University of Illinois in the United States. 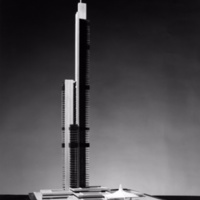 Architectural model, Competition entry 058, City Hall and Square Competition, Toronto, 1958, by Hans G. Egli of the United States. 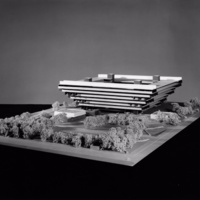 Takeo Ito entry City Hall and Square Competition, Toronto, 1958, architectural model. 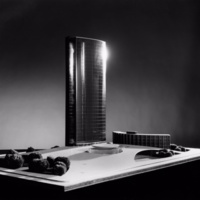 Competition entry 324, City Hall and Square Competition, Toronto, 1958, by Takeo Ito of the United States. Model. 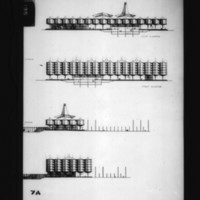 4 architectural drawings on 1 sheet, Competition entry 429, City Hall and Square Competition, Toronto, 1958, by D. R. McMullin of the United States. South, west, north and east elevations showing Council Chamber and future expansions. 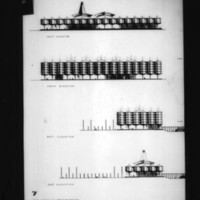 4 architectural drawings on 1 sheet, Competition entry 429, City Hall and Square Competition, Toronto, 1958, by D. R. McMullin of the United States. 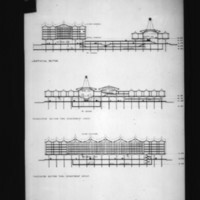 Court elevations with details of Council Chamber and showing future expansion. 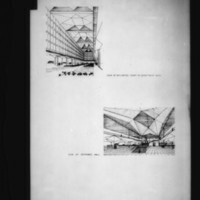 2 architectural drawings on 1 sheet, Competition entry 429, City Hall and Square Competition, Toronto, 1958, by D. R. McMullin of the United States. Perspective drawings of interior showing skylighted court in department area and entrance hall. 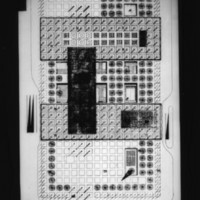 Architectural drawing, Competition entry 429, City Hall and Square Competition, Toronto, 1958, by D. R. McMullin of the United States. 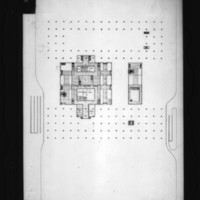 First floor plan showing department area offices, government area offices and archives. Architectural drawing, Competition entry 429, City Hall and Square Competition, Toronto, 1958, by D. R. McMullin of the United States. Pulic access area plan. Architectural drawing, Competition entry 429, City Hall and Square Competition, Toronto, 1958, by D. R. McMullin of the United States. 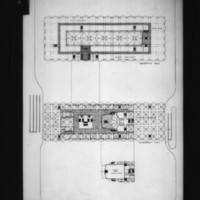 Lower plaza plan showing public access area and offices.